There’s been an outpouring of well wishes and words of understanding and concern arriving since my post about SAD. Thank you everyone! I had no idea I knew so many people who have been dealing with this problem for years! Here are some of the ways we’ve been making the dark days more bearable. Have something to add? Screw the electric bill for a couple of months…keep the lights on. Take the screens off the windows. Try to get outdoors on sunny days & take a vitamin D supplement. Listen to books on CD if you feel like you can’t focus on the printed page. 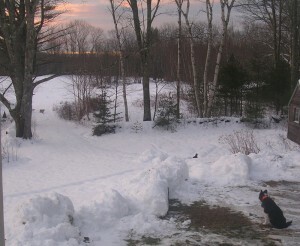 A week ago, we got about 10 inches of snow during the weekend. 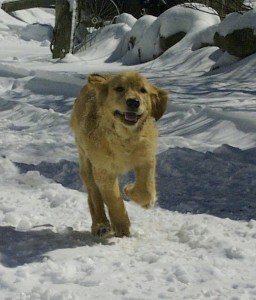 Normally, we’d have been moaning and complaining but this storm was a wonderful gift for our sweet Golden, Sadie. She was weaned in the snow and she made no bones about it being her favorite time of year. Sadie and her sibs with Mom, Maisie. A happy happy snow puppy! Sadie passed away last Monday but not before she’d enjoyed a stroll down the lane to the pasture. She stayed awhile… Maybe she was remembering the first snow of this year when she was well and able to orbit around the yard, kicking up white clouds. Syke patiently waits for Sadie to come up from the pasture. We’re so fortunate to have had her in our lives for 10 years and to have so many wonderful memories of her. We miss her terribly. Right around the time we changed the clocks, I slid into a deep dark pit. I’m really not a drama queen…believe me when I say this was pretty scary. The “winter blues” have danced around me in the past but that was nothing compared to this year. I come from a “pull yourself up by your bootstraps and carry on” kind of background and that strategy had always worked before. But not this time. It took hold…I tried to pull myself out of it but didn’t make much progress. Daily, I did what needed doing…barely…and would collapse in an exhausted heap afterward. So…why no posts? The exhaustion wasn’t just physical. I couldn’t put two thoughts together, couldn’t make decisions. There was this mental image of my brain looking something like 3-day old oatmeal. It was miserable and more than anything…frustrating. But here I am…still on the edge of the pit… but with one leg up and my fingertips on the boothstraps! As I write, I’m “charging up” with my new best friend, goLITE. 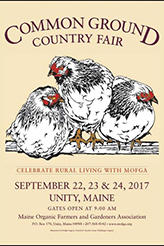 This has been a godsend and I thank my friend, Jane, who lives in the Northeast Kingdom of Vermont. She introduced me to blue light therapy at Rhinebeck. My mistake was not buying one of these little wonders immediately. If I had, I might have been able to avoid total collapse. Anyway, daily “charging up” has really helped, the days are getting longer now and having some snow on the ground has made a huge difference. Even on grey days, it’s brighter. I took the screens off some of the windows in our house, too. What a difference! 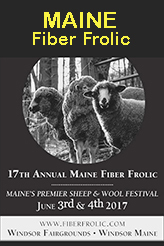 Nuff about me…much more interesting farm and fiber stuff coming. We have a lot of catching up to do! 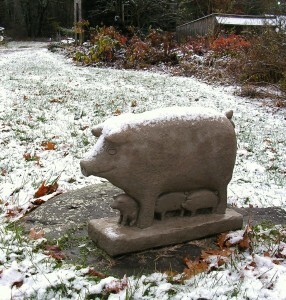 This is Mrs Pig, the Hatchtown version of the ever popular and much loved garden gnome. AKA WeatherSow! You’ve no doubt heard the saying “frost on the pumpkin” Well, this is “snow on the piggie” and it’s just a little taste of what’s to come — a reminder that it’s time to pick up/put away all that summer stuff that’s leaning against the barn wall or laying in front of the sheep shed. You know, all that stuff that’ll destroy the shear pins on the snow blower or make the plow guy very grumpy. Mother Nature has granted us a week of 50 degree days so we’ll grab the chance to get this stuff done. 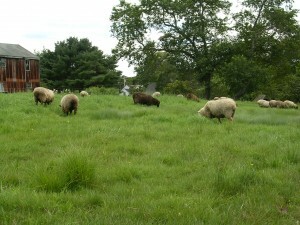 Awhile ago when we still had some decent pasture left, I remembered to take the camera along on one of our sheep moves. This was an “easy” one — we just needed to open a fence and let the group through to the new grass — but I thought it’d be fun to document happy sheep. Even after so many years of doing this, they make me smile and I just have to stand and watch them while they get settled into their new pasture. 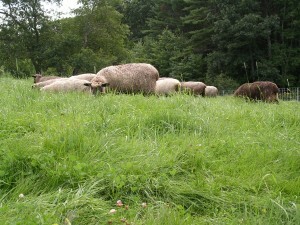 Usually when we show up to check on everybody, the sheep don’t pay much attention. One or two of the girls might look up just long enough to register our arrival…no big deal. But if we begin to fuss with the fence…turn off the charger or walk toward the dividing fence… it becomes obvious that at least one of them has been keeping an eye on us! As soon as Jim starts to fiddle with the fence, he has everyone's undivided attention! 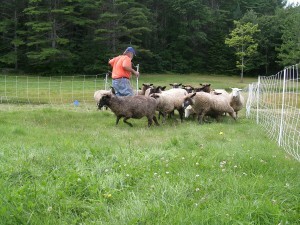 When Jim opens the fence, they race through to the new grass. The ba-a-a-aing is deafening and excited! This girl must've been napping! Wait for me!! 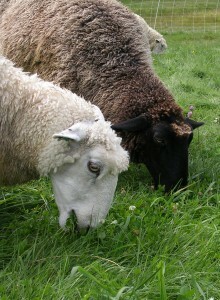 At first, they're so happy to be munching fresh greens that they graze as a group. Before too long, though, they spread out and begin sampling all the different offerings on this salad bar. Lark (white) and Serafina have found a lovely patch of clover -- YUM! 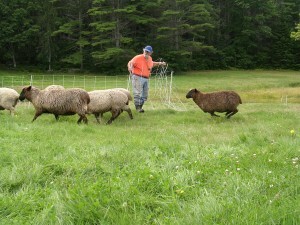 IT DOESN”T TAKE MUCH TO MAKE SHEEP HAPPY!